The Government of Canada will increase the number of MPs to up to twelve (12) from the current seven (7) in line with the Province of New Brunswick electoral districts. Vancouver Island has more population than New Brunswick. Vancouver Island’s population is increasing, whereas New Brunswick’s population is decreasing (see table 1). Recall legislation would apply for VanIsle MPs. The Government of Canada will guarantee up to ten (10) elected and/or appointed Senators for eight (8) year terms from a list provided by the Government of Vancouver Island with elections spaced so that there are overlapping terms of office. Recall legislation would apply for VanIsle Senators. The Government of Vancouver Island will either contribute to or receive funding from the Government of Canada whether or not it is a “Have” or “Have Not” province according to the equalization payments formula for the Canadian federation. 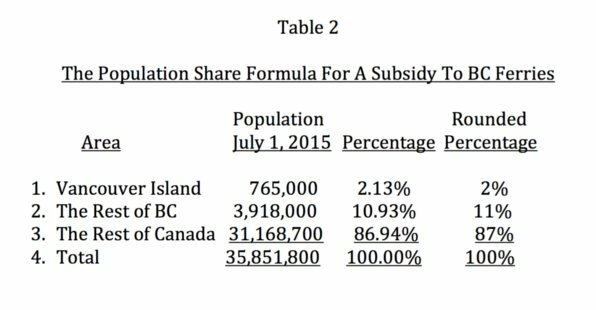 The Government of Canada will pay off the Province of Vancouver Island’s share of the BC provincial debt and unfunded liabilities, calculated by Vancouver Island’s share of the BC population. 2. Reduced fares on automobiles and other vehicles including trailers and RVs. 3. Substantially reduced fares for the movement of freight coming or going for merchandise payloads of 2 tonnes or more. The Government of Canada will build a Light Rail Transit (LRT) system for the Capital Regional District (CRD) as illustrated in the basic “Line Map” – Map 2 – which names required major stops and outlines the proposed routes. A LRT extension to Sooke will also be built. As a first phase, of this LRT system – Sooke to Langford to Uptown to Downtown Victoria to the Cruise Ship Terminal at Ogden Point– will be started within two (2) years and completed within five (5) years of Vancouver Island becoming a Canadian province. The second phase connecting Uptown to the Victoria International Airport and Swartz Bay BC Ferries terminal with stops along the way will be started within three (3) years and completed within six (6) years of Vancouver Island becoming a Canadian province. As a first phase, the Government of Canada will build a Light Rail Transit (LRT) system for the Regional District of Nanaimo to provide service from the main line -The Esquimalt and Nanaimo (E&N) Railway -from Duke Point BC Ferries terminal to the Nanaimo International Airport, to the Woodgrove Shopping Centre, with stops along the way to connect with other shopping centres. This LRT system will be extended for stops at Lanzville, Nanoose Bay, Parksville and Qualicum Beach. 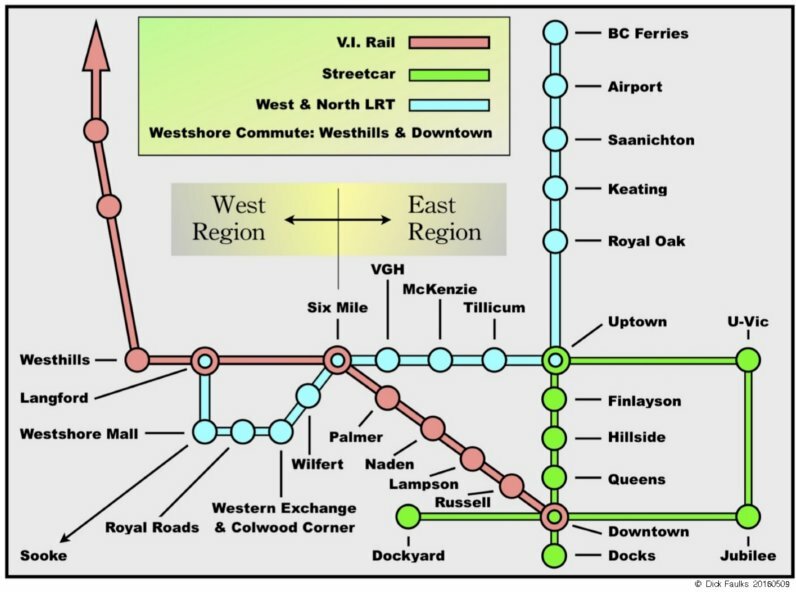 As a second phase, the Government of Canada will build a Light Rail Transit (LRT) system for the Regional District of Cowichan Valley (and North Cowichan) to provide service from the main line – the Esquimalt and Nanaimo (E&N) Railway from the Duke Point BC Ferries Terminal to Ladysmith, Chemainus and Duncan. The first phase of this LRT system will be started within two (2) years and completed within five (5) years of Vancouver Island becoming a Canadian province. The second phase of this LRT system will be started within three (3) years and completed within six (6) years of Vancouver Island becoming a Canadian province. The Government of Canada will build a Light Rail Transit (LRT) system for the Regional Districts of Comox Valley and Strathcona from the main line – The Esquimalt & Nanaimo Railway – to serve Comox Airport, the Comox BC Ferries terminal to Powell River and to connect to Comox, Courtenay and Campbell River major shopping centres and communities along the way. This LRT system will be started within two (2) years and completed within five (5) years of Vancouver Island becoming a Canadian province. The Government of Canada will rebuild and twin-track the bed of the E & N Railway in its entirety to Class 3 standard, including continuous welded rail, and extend the line to Campbell River and potentially beyond to the ferry terminal at Port Hardy with stops at communities along the way in the Regional Districts of Mount Waddington and Strathcona. The extension from Duncan to Youbou to Bamfield, as well as the extension from Parksville to Port Alberni and Long Beach (Ucluelet/Tofino) will also be upgraded to the same standards. These rebuilds and extensions can be done in short order since the necessary equipment will be on Vancouver Island at that time. The VanIsle Party fully supports the work of the Island Corridor Foundation (www.islandrail.ca) and other groups seeking to re-establish and extend the E&N Railway. 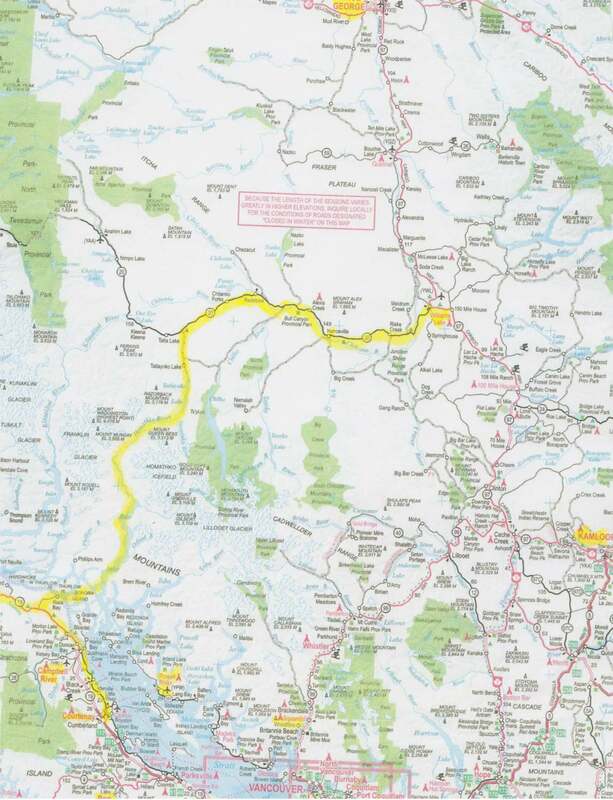 Map 3 shows the existing E&N Railway and the extensions proposed by the VanIsle Party. The first phase of this E&N main line upgrade – (1) Victoria to Campbell River, (2) Parksville to Port Alberni and Long Beach (Ucluelet/Tofino) and (3) Duncan to Youbou to Bamfield – will be started within two (2) years and completed within five (5) years of Vancouver Island becoming a Canadian province. The second phase – (4) the extension of the E&N Railway from Campbell River to Port Hardy will be started within three (3) years and completed within six (6) years of Vancouver Island becoming a Canadian province. A Government of Vancouver Island would request that the Government of Canada honour its original 1871 Confederation Railway promise to connect Vancouver Island by rail to the rest of Canada with the Pacific terminus to be Esquimalt/Victoria. This is a long-standing historic grievance that must be resolved for Vancouver Island to become a province of Canada. Map 4 shows the original railway promise to British Columbia for joining the Canadian Confederation in 1871. The survey of 1872-73 evaluated and proposed connecting Vancouver Island to the mainland at Bute Inlet by bridging Seymour Narrows and adjacent islands (Quadra, Sonoro and Stuart). That route continued up Bute Inlet and its Homathco River Valley to the BC Interior. It was considered to be a “practicable line” by Sir Sanford Fleming. This original railway proposal extended the railway connection down the eastern side of Vancouver Island with the Royal Navy base at Esquimalt as its Pacific terminus. VanIslers were frustrated throughout the rest of the 1870’s with the lack of any progress on this Confederation promise. The Government of British Columbia even voted to leave Confederation in 1878 because of this issue. Prime Minister Sir John A. Macdonald was re-elected in 1879 with his National Policy of high tariff protection for eastern manufacturers, immigration and, again, the trans-continental railway. With a stroke of his pen, the railway route was shifted to the Fraser River and Canyon with its terminus at Port Moody and, later, the City of Vancouver. Sir John A. as Member of Parliament for Victoria gave VanIslers a “consolation prize”, being the short line Esquimalt and Nanaimo (E&N) Railway, with construction lead by a syndicate organized by coal baron, Robert Dunsmuir. Another group would have built the original promised route via Bute Inlet at that time, but they were unable to get the necessary financial backing. The VanIsle Party wants to restore the E&N Railway to its former glory and extend it on Vancouver Island to conform to the original promise by the Government of Canada in the 1870’s. A railway connection via Bute Inlet and the Homathko River Valley would connect at Highway 20, move eastward to connect at Williams Lake to link with the Canadian National Railway (CNR). There is an existing CNR line northward to Prince George along Highway 97 and eastward to Edmonton. Connections southward to Kamloops, Kelowna, other BC communities and Calgary would also be considered. Rail transport of products to and from Vancouver Island to the rest of BC and Canada will substantially lower the cost of goods bought and sold on Vancouver Island and avoid costly ferry delays and high ferry charges. Our VanIsle cost of living would be substantially reduced. Shipping containers travelling by train over this route would be shipped overseas at the Port Alberni Container Trans-Shipment Hub (PATH) to Pacific Rim countries and beyond. Likewise, containers arriving at the PATH would be shipped economically by train to the rest of Canada. The VanIsle Party supports the Port Alberni Port Authority (PAPA) in their proposed $1.7 billion Port Alberni Container Trans-Shipment Hub (‘PATH’) project. The PATH project is an opportunity to develop a container trans-shipment hub to serve markets on the Canadian West Coast, including along the Fraser River, along the North West United States (together with the Pacific North West, or PNW) and, from there, further inland, including the US Mid-West. The project is premised on a hub-and-spoke container trans-shipment operation concept. It envisages a terminal of 400 acres with an annual capacity of 3.5 million TEUs (hub). From PATH, coastal ports and terminals would primarily be served by feeder barge service (spokes). The PATH project would be operational by 2022. The VanIsle Party is a “PATH Believer” and will promote this project wherever possible as being positively transformational for Vancouver Island, the rest of British Columbia, other western provinces and the State of Washington from economic, social and environmental perspectives. 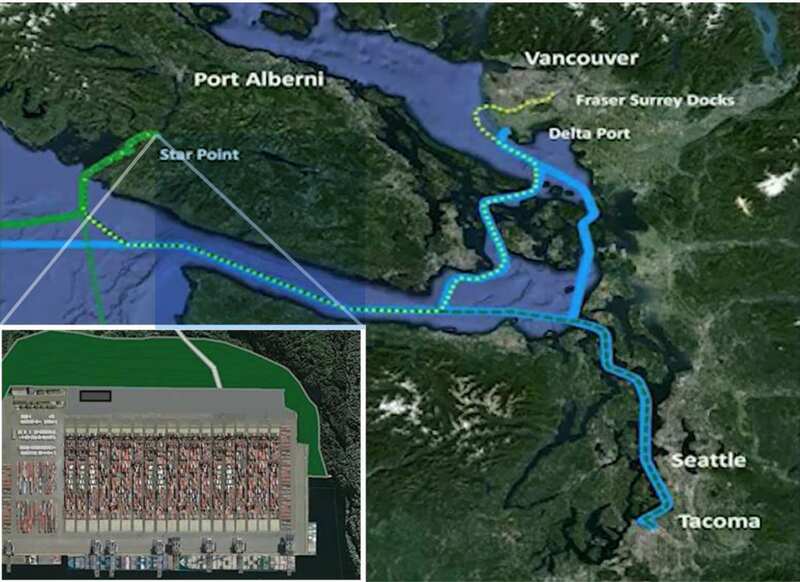 The idea behind PATH is to barge shipping containers from the ports of Vancouver, Seattle and Tacoma to Port Alberni where container tankers can safely travel the Alberni Inlet to the Pacific Ocean and beyond. Incoming cargos will travel the other way to Vancouver, Seattle, Tacoma and the Pacific North West. The VanIsle Party supports this project and its MLAs will promote it and work with other elected officials at all levels of government to seek the required funding. The PATH is a relatively environmentally friendly way to improve capacity on the West Coast. It does not require as much environmentally damageable construction methods as other projects and it reduces truck emissions. Overall it is a greener way to handle future container capacity constraints in Vancouver and the Pacific North West. Map 5 illustrates the PATH concept. The Government of Vancouver Island would seek Government of Canada infrastructure investments of up to 75% of the funds needed for the PATH project as a part of its Provincial Terms of Confederation. It would also seek funding from the provinces of British Columbia, Alberta, Saskatchewan and Manitoba in the New West Partnership, as well as the State of Washington and shipping companies for the balance of the required funding. The VanIsle Party supports the development of a West Island road and rail connection to link with the existing Pacific Maritime Circle Route from Victoria to Port Renfrew to Cowichan Lake to Duncan to Victoria. 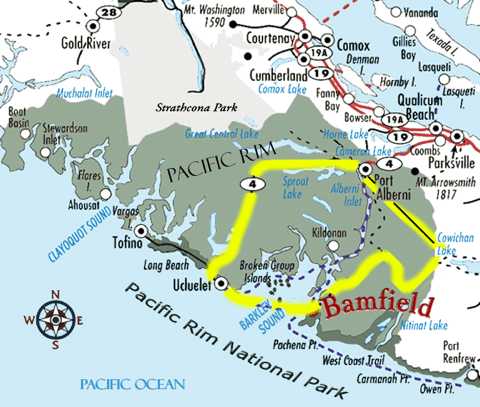 The existing all-weather road on the north side of Lake Cowichan to Youbou would be extended with rail to Bamfield, with a BC Ferries connection to Ucluelet. There would also be an all-weather connector road and rail from Cowichan Lake to Port Alberni and a road upgrade from Port Alberni to Bamfield. The Government of Vancouver Island will seek infrastructure investment for these connector roads and rail from the Government of Canada as part of its Provincial Terms of Confederation. These projects will be started within three (3) years and built within twelve (12) years of Vancouver Island becoming a Canadian province. BC Ferries will provide a regular BC Ferries service to Haida Gwaii from Port Hardy for local traffic and a new tourist attraction (“The Haida Gwaii Express”) from Victoria to Port Hardy to Haida Gwaii and return, with stops along the way on the extended Esquimalt & Nanaimo (E&N) Railway to boost tourism in other Vancouver Island communities. The highway from Campbell River to Port Hardy will also be improved. This new ferry service will be introduced once the E & N Railway extension to Port Hardy has been completed. The Government of Canada will guarantee that there will be no military base closures at CFB Esquimalt, The Pacific Maritime Command at Esquimalt, the 443 Maritime Helicopter Squadron at Victoria International Airport, the Royal Canadian Air Force Base at Comox and military stations. The Government of Canada will pay eighty percent (80%) of the cost of preparing all public buildings- federal, provincial, regional, municipal, colleges, universities, public schools and hospitals – to prevent earthquake damage. These projects will be started within two (2) years and built within twelve (12) years of Vancouver Island becoming a Canadian province. The Vancouver Island Party recognizes that preliminary data shows that in 2013, global carbon dioxide emissions were 61% higher than were they were in 1990, when negotiations toward a worldwide climate treaty began in earnest. The Vancouver Island Party recognizes that in the 2009 Copenhagen Accord, the major polluting governments, including China and the United States, signed a non-binding agreement pledging to keep temperatures from increasing more than 2 degrees Celsius (3.6 degrees Fahrenheit) above where they were before we started powering our economies with coal. Since then, the temperature increase has amounted to 8% Celsius accompanied by many alarming impacts, including the unprecedented melting of the Greenland ice sheet in the summer of 2012 and the acidification of oceans far more rapidly than expected. Allowing temperatures to warm by more than twice that amount will unquestionably have perilous consequences. The Vancouver Island Party recognizes the World Bank 2012 Report on the gamble implied by the 2 degrees Celsius target. “As global warming approaches and exceeds 2 degrees Celsius, there will be a risk of triggering nonlinear tipping elements. Examples include the disintegration of the West Antarctic ice sheet leading to more rapid seal-level rise, or large-scale Amazon dieback drastically affecting ecosystems, rivers, agriculture, energy production, and livelihoods. This would further add to 21st century global warming and impact entire continents.” In other words, once we allow temperatures to climb past a certain point, where the mercury stops is beyond our control. The World Bank also warned when it released its report that ‘we’re on track for a 4 Celsius (7.2 degrees Fahrenheit) warmer world (by century’s end) marked by extreme heat waves, declining global food stock, loss of ecosystems and biodiversity, and life-threatening sea level rise. The Vancouver Island Party recognizes that the usually staid International Energy Agency (IAE) issued a report in 2011 projecting that we are actually on track for 6% degrees Celsius (10.8 degrees Fahrenheit) of warming. And as the IEA’s Chief Economist put it: “Everybody, even the school children knows that this will have catastrophic implications for all of us.” “If we do not get our emissions under control by 2017, our fossil fuel economy will “lock-in” extremely dangerous warming. “The door to reach 2 degrees is about to close.” In short, we have reached what some activists have started calling “Decade Zero” of the climate crisis: we either change now or we lose our chance. The evidence indicates that 6 degrees of warming is likely set in motion several major tipping points – not only slower ones such the aforementioned breakdown of the West Antarctic ice sheet, but possibly more abrupt ones, like massive releases of methane from Arctic permafrost. The accounting giant PricewaterhouseCoopers has also published a report that we are headed for “4% Celsius,” or even 6% Celsius of warming. Recognizing the reality and threat of rising sea levels to the well-being of the people of Vancouver Island, the Government of Canada will invest 80% toward the building of dykes and/or seawalls on all parts of Vancouver Island that are at risk. These structures will also provide protection from the ever-present threat of tsunamis from the Pacific Ocean and surrounding countries. These projects will be started within three (3) years and built within twenty-four (24) years of Vancouver Island becoming a Canadian province. The Government of Canada will use its influence with the World Trade Organization (WTO) to prevent the WTO from challenging green energy programs under its international trade agreements on the grounds that these local programs contain supports for local industry, which the WTO considers protectionist. Other free trade agreements such as the North America Free Trade Agreement (NAFTA) and the Trans Pacific Partnership may also contain similar provisions. The Government of Vancouver Island will want to support local industry to make Vancouver Island the most renewable energy jurisdiction in the world. The provincial goal will be 100% renewable by 2030. The local production of renewable equipment and services in VanIsle’s “Green and Clean Economy” is expected to become a major export-oriented industrial sector. At the present time, this goal would be challenged by the WTO, and perhaps other trading organizations of which Canada is a partner. The Government of Canada will pay all court and related expenses should the WTO, NAFTA or any other free trading organization take the Government of Vancouver Island to court for having a green industrial policy initiative. The Government of Vancouver Island will seek fair market value from the Government of Canada of all provincial Crown Lands transferred to First Nations in their treaty negotiations. Therefore, it will be important that the Government of Vancouver Island be involved in these treaty negotiations in order to calculate the fair market values of these lands. All compensation revenues from the Government of Canada to the Government of Vancouver Island from the transfer of provincial Crown Lands to Vancouver Island First Nations will be invested in and dispersed from The VanIsle Stewardship Fund for the benefit of all VanIslers. Elections BC will hold referendums to determine whether or not the residents of Haida-Qwaii, the Regional District of Powell River, or the Regional District of the Sunshine Coast want to be included in the Province of Vancouver Island.